Maceo Parker, mister 2% Jazz, 98% Funky Stuff, is a musician, singer, songwriter, saxplayer who played with everyone: James Brown, Sly Stone, George Clinton, Bootsy Collins, Prince, ... Find out news, tour dates, biography, discography, photos gallery, rare audio material and many more. To Maceo's fan site ! New Album : School's In !!! 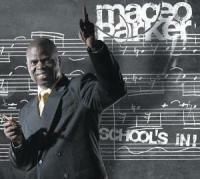 Maceo Parker blows his horn! Parker's jabbing workouts in the midst of "Papa's Got a Brand New Bag" and "Cold Sweat" made him a household name among '60s funk fans — not bad for a kid fresh out of college who got the gig primarily because Brown coveted his brother Melvin's drumming chops. Now Parker is a star in his own right. His Verve albums "Roots Revisited" and "Mo' Roots" impeccably spotlight his soul-drenched alto sax on a sizzling hybrid of funk, R&B, and jazz. And he's brought along his ex-section mates from Brown's band — trombonist Fred Wesley and saxist Pee Wee Ellis — to stoke the almighty groove. The North Carolina product quit Brown several times. Along with his bandmates, Parker mutinied in 1970 to form Maceo & All the King's Men, only to return to the fold three years later; later in the decade, he worked with Parliament/Funkadelic and Bootsy's Rubber Band. But when Brown was incarcerated, Parker was there for him, releasing a rap song that urged the Godfather of Soul's immediate freedom. With his newfound solo fame, however, it's doubtful that you'll see Parker back in Brown's horn section anytime soon.